I can’t get warm today!…I have put the heating on FULL and I am cozied up on the chair by the fire in the sitting room. We have snow again, but its that silly kind that really should be rain…at least it has started to melt. I have been looking through my old photos and decided to show you some of them…piccies that I havn’t looked at for ages and some that I had forgot I had altogether! So rather than actually blog about more snow (coz I have actually had enough of it all now!) I thought I would show you some Happy pics 🙂 and that way, hopefully the snow will get the hint! Don’t the winter months seem so long, those ‘orrible dark nights…errr! I hate them and yet summer flies past! 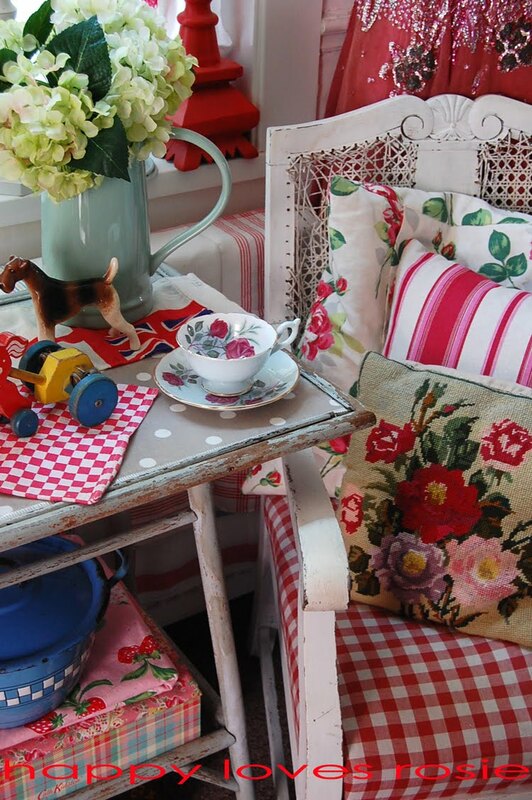 I can’t wait till Spring…I have decided that is my favourite month…because here in the Happy House’s Garden, there is so much to get excited about…the beautiful flowers and shrubs that appear here are fabulous. …and its also a time for sorting and re-arranging….and I love all that kinda thing. My feet are starting to warm up now, well they should of done really, as I have 6 pairs of socks on, with Uggs and the fire on! Phew! and thats not including the central heating! which is on FULL!…STILL! Really I should do some exercise…the washing up needs doing! does that count as exercise! in my book it does! as I have been sooo lazy lately…oh yes, lazier than little Maxi above! although wherever I am…Max is not far behind! Bless him I am sure he thinks I am his Mummy! I know most of you think he is a puppy, but Max is in his 7th year, but is soooo small, he is ever so sweet and doesn’t eat much, if you give him something to eat and he doesn’t fancy it…he will hide it somewhere in the house! he is sooo funny, as he digs the Rugs up as if it was mud in the garden and shoves food underneath them, ahhhh! ain’t that sweet! yes it is! Until you trip over it!!! Arghhhhhh! that ain’t a pleasant experience! LOL! Just had dinner…Yes I decided to move and actually I am feeling quite warm now! Infact I am feeling quite sick! My feet feel about 200 degrees and I am feeling very dizzy! I think I will have to go out and get some air! Or take some of my layering off….I think perhaps that scarf and hat took me over the warmth threshold! Especially once I fired up the stove to make dinner! LOL! Yes! I will have to look into seriously getting fit soon. Perhaps starting to take Max for a walk again will do the trick….no-one wants to take him out in our house, as he never has really grasped the idea of cocking his leg and just doing the one poo! (sorry about that!) Nope Max will poo at every lamp post and wee like a girl! LOL! Rosie has just left the house, she will be staying around a friends house tonight and they will be going to college together in the morning….rather than go upstairs, she has decided to borrow my Uggs for the trip to college in the morning…at least I am starting to cool off a bit now! The House is quiet once more and I am sitting back on my cozy chair by the fire!…which is now turned OFF! Phew its hot!…I am watching ‘Great British Railway Journey’s’ with Michael Portillo, I have found this series very interesting indeed, today he has taken a steamboat tour of lake Windermere….which looks sooo beautiful…I Want to go too!. I have come to the end of my photo’s…I hope you have enjoyed them and they have helped make you feel happy 🙂 I had better go now as my feet are beginning to feel a little cold again! obviously bad circulation! Eek! all this feeling hot and cold throughout the day is hard work in itself….Goodness only knows what the heating bill will be like! I love your blog. It is so colorful. You make beautiful settings with the most simple of things. Kudos to you for a job well done. I would like to invite you to http://www.thrifthappy.com. I hope you will take my bedroom challenge. 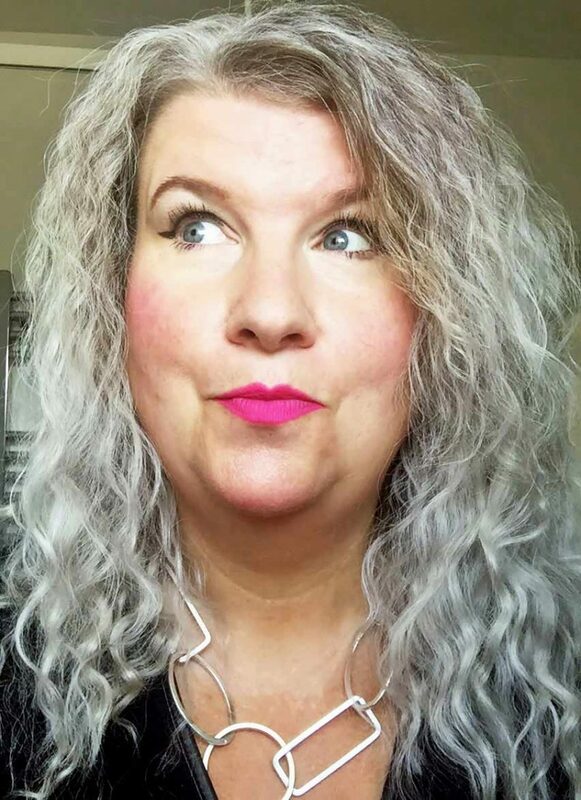 I would love to see what you would come up with.Thank you and best of luck! 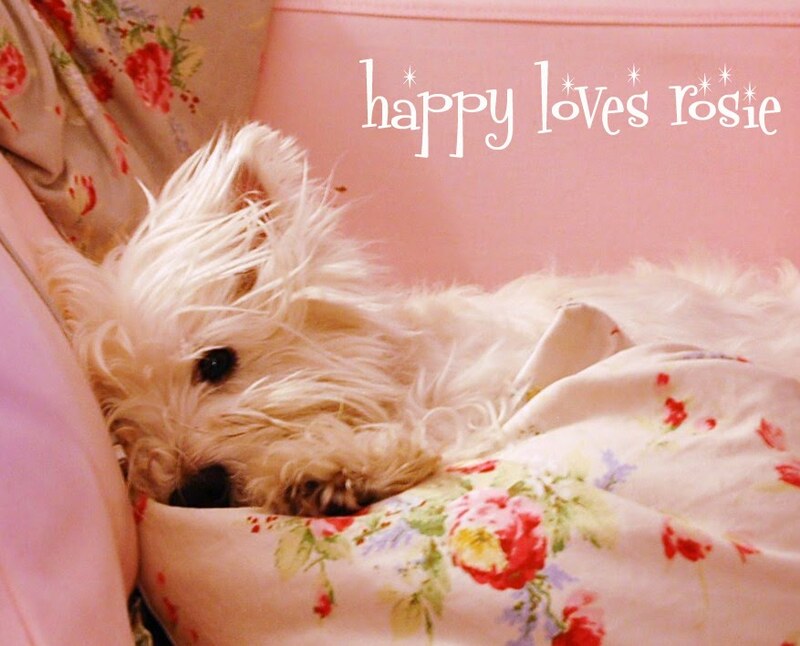 You always make me smile…I so adore your lovely blog and your sweet image of your puppy is so adorable! Thanks for making my day once again! lovely photos – makes me want spring to be here now. Such Happy pics! Dear Max is adorable, quirky habits and all! Thanks, for the canister info, Happy…I've never heard of that store, which probably means I can't find it in the US! 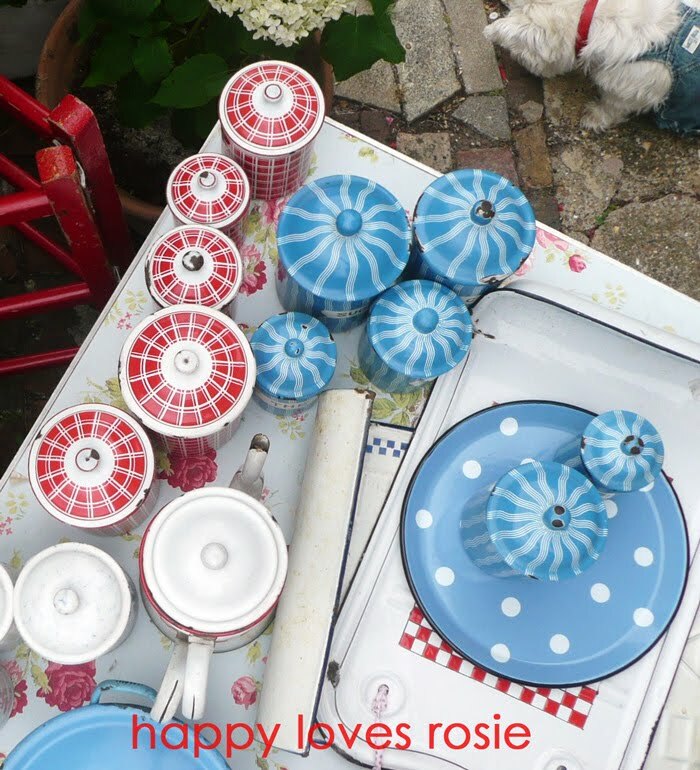 I've had fun looking through your new pics…lots of Cath Kidston in your home! Another place we cannot visit here! Love to visit it in your home! Love all the pretty eye-candy. Great photos.Happy New Year! Just when I thought I was the only one in the world that LOVES red I find you!!!! I do believe miss you are the queen ! I so LOOOOOVe your blog and will be a constant visitor. come on over for a visit sometime. Texas needs a another red queen…. Your pics are so pretty! I love happy colors, too! I enjoyed all of your pictures and I hope you stay warm! Adorable photos – I bet you warmed up just looking at them! Is that a collection of 'Knitting Nancy's in one photo? They go together so well.Stay warm and well, Happy.